T’wasn’t the night before Christmas or anything but it sure felt like it in British Columbia after Mazda dragged us out of our climatic cove in Northern California and dropped us at Canada’s Whistler Mountain. Here, Christmas lights and puffy snow dripping off pine trees blended together to make every angle look like a Hallmark holiday postcard. The crisp mountain air was hard on exposed skin but perfect for the fleet of Soul Red Crystal CX-5s located outside of our warm hotel. This wasn’t just because the multi-layered paint job stood out like a red carpet against grey skies and roads dusted white by the snow, but because of the way the turbocharger could compress the low-pressure air to stop the horsepower leak that usually springs at elevation. Armed with the new powerplant and a host of upgrades, the new Signature-trimmed CX-5 completes the final step in Mazda’s brand evolution. We gained firsthand experience with Mazda’s push to become a more premium brand in March of 2017 the second-generation CX-5 and seeing how it punched outside its weight class in all areas except one: passing power. Mazda has solved this problem by putting the same six-speed automatic gearbox and turbocharged 2.5-liter SkyActiv inline-four that powers the CX-9 and Mazda6 into the CX-5 Signature. The engine carries over the same output it has in the other cars: 250 horsepower on 93 Octane fuel, 227 horsepower with 87 Octane, and 310 lb-ft of torque delivered over a broad range of RPMs regardless of fuel type. Along with the added power comes added control. The Grand Touring Reserve and Signature models, the only two trims to get the 2.5-liter turbo, come standard with i-ACTIV all-wheel drive and therefore see combined fuel economy drop by 2 mpg, from 26 to 24 mpg. What doesn’t change is just about everything on the exterior, which in the CX-5's case is a good thing. Its sharp lines haven’t gained a wrinkle since their debut at the 2016 LA Auto Show and the only real way to spot the Signature or Grand Touring Reserve trims without climbing inside is to get lucky guessing upon seeing a CX-5 with its mirrors folded (the two turbo’d trims get automatic folding mirrors) and AWD badges on the rear to complement newly designed 19-inch alloy wheels. 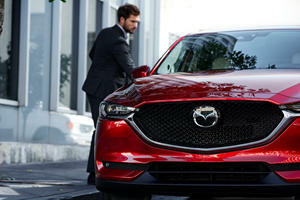 As the rule has always been, no Mazda looks quite as gorgeous without that tint of Soul Red Crystal, but the defragmented front end and thin headlights maintain the air of modernity across the rest of the color pallet while a curvy rear end uses its shape to promote all 30.9 cubic-feet of cargo space (59.6 with the second row folded) without giving the CX-5 a bad angle. The cabin's upgrades are not so subtle. Here live almost all the luxury-related upgrades given to the Signature trim including Caturra Brown Nappa leather seats—now with ventilation for the front row in addition to the heating abilities of all seats (save for the middle-rear) and the steering wheel—wood trim to contrast satin chrome accents, a black headliner, and new ambient LED lighting. One of our new favorite features, however, makes it to the Touring trim and up and can be found when plugging a smartphone into a dedicated USB port and seeing Apple CarPlay or Android Auto cue up on the 7-inch touchscreen display. Mazda, in its never-ending pursuit of a more ergonomic interior, worked with Apple and Google to fine-tune interaction between the rotating control knob nestled behind the shifter and the smartphone integration software. It may seem like a small thing, but the Mazda ethos has always been to make a car feel like a natural extension of its driver and with a well-oiled tech suite now in place, the CX-5 takes a big step towards reaching its goal. What brings the CX-5 to fully realize its ambitions is the way that its road behavior is always a direct reflection of a driver’s wishes. We couldn’t find much to complain about with the handling on this generation CX-5. It rides well for a vehicle that’ll live most of its life on paved road and leans towards delivering comfort rather than high corner exit speeds. But engineers apparently thought they needed to change this rendition’s front geometry to reduce understeer, give it lower friction dampers and new top mounts to make going over bumps feel even smoother, and add a rebounding feel to the dampers so the CX-5 feels flatter through a corner. G-Vectoring control, a program that electronically “lifts” the throttle when cornering to put more weight over the front tires, has been renamed "G-Vectoring Plus" because Mazda now makes the CX-5 lightly apply the brakes to the outside front wheel when a turn is complete to “drag” it and make rewinding the steering wheel to center a smoother process. The combination of extra power and the technology to control it brings the CX-5 to new heights….or so we’d assume. 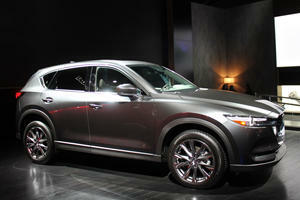 The thing is, we hardly got a chance to drive the CX-5 in a way that fully tested its upgrades. Given Canada’s strict speeding laws and the fact that snow was piling on the ground while we drove, not even a set of snow tires and an extra 146 pounds of new drivetrain pushing the tires into the powder could get us to fully access the CX-5's performance. To compensate, Mazda built us a makeshift slalom course right on the snow so we could hear the confirming hiss of the turbo and feel the engineers’ unique approach to tuning the all-wheel drive and stability control systems. Rather than coddle a driver in an artificial blanket of safety by making the stability control cut in the second wheels start to slip, engineers tuned in a little leeway to give drivers a better sense of the CX-5’s limits responsibly rather than project artificial control that impresses until an emboldened driver takes it too far. Armed with a clever i-Activ all-wheel-drive system that can predict the surface the vehicle is on and adjust where power is sent, it’s possible to hustle the CX-5 around corners in low-grip conditions by turning the wheel, adding throttle, and feeling the chassis comply to the best of its abilities. If you aren’t driving manically like we tend to (read: if you drive cars like a normal person), it’s easy to miss the commotion going on in the wheel wells and bask in the comfort of heated surfaces, a comfortable suspension, and soft Christmas music playing through Bose speakers until you reach your destination. With rubber weatherproof floor mats and other snow-friendly features available from the accessories menu, the CX-5 puts on an impressive show as a vehicle you can depend on in the snow. While previous models offered so much bang for your buck that there was enough cash left over to get a good pair of snow tires, the new CX-5 isn't quite as cheap. As you’d expect, the new power mill and beefed-up transmission makes up the bulk of the premium for the Grand Touring Reserve and Signature models, but the new toys inside feel less worth the price. Not that Nappa leather isn't nice, but the look of a CX-5 dominated by lighter leather colors is a flavor we miss in the Signature. 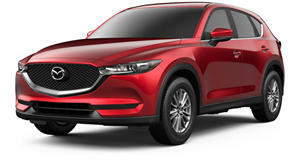 Fortunately, that color combination is possible on the Grand Touring Reserve, which starts out at $35,865, while the CX-5 Signature costs $37,885—both including the $995 destination for all states but Alaska (that costs $1,040). 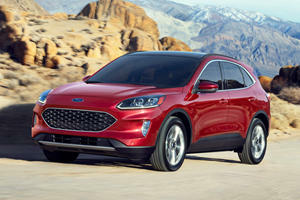 Both trims eliminate the need to decide whether to pay $1,400 for the i-Activ AWD system, but their prices also mean the 2.5-liter turbo and its six-speed can be considered a $3,425 option when the Grand Touring Reserve is compared to the next highest trim, the $32,440 all-wheel-drive Grand Touring. The rest of the model-wide upgrades give the CX-5 an overall price bump of $200, with the base front-wheel-drive CX-5 Sport starting at $25,345 and front-wheel drive CX-5 Touring starting at $27,610. During our first soirée with the CX-5, we came away feeling like this underrated crossover raises the bar for the rest of the segment. And while it’s nice to know that the CX-5 we first fell for has been improved upon and can now be bought with more horsepower and premium materials, we found ourselves missing one toy to make this competition one that Mazda wins without question: a panoramic moonroof. Yes, it's just a taste thing. More room to enjoy the Christmas lights with than the CX-5's standard-sized moonroof, but the fact that it's one of the few faults we can find means the CX-5 should be on the short list of presents to beg Santa Claus for.